The Ram 3500 is always a top model at Riverside Dodge Chrysler Jeep. This heavy-duty pickup truck was manufactured with features that enhance power, performance, and efficiency. 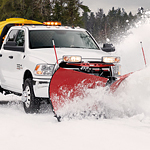 The Ram 3500 offers two engine options and three transmission options. The 6.4L HEMI V8 engine is offered with the Ram 3500. This engine was made with two spark plugs per cylinder to increase power. This engine can tow up to 7,475 kg and can reach up to 410 horsepower, which is best-in-class. The 6.7L Cummins Turbo Diesel I6 engine can produce up to 385 horsepower and 930 lb.-ft. of torque. This engine comes with best-in-class towing of 13,984 kg. The class-exclusive six-speed manual transmission comes with a wear-compensating clutch that offers reliable performance throughout the lifespan of the powertrain. This transmission is only compatible with the 6.7L Cummins Turbo Diesel engine. The six-speed automatic transmission is standard with the 6.4L HEMI V8 engine. For additional capability, you can choose the available AISIN six-speed automatic transmission.